Washington's persistent difficulties in Afghanistan are due to the Obama administration's mission creep. Within a matter of months, U.S. operations expanded from counterterrorism measures designed "to disrupt, dismantle, and defeat al-Qaeda in Pakistan and Afghanistan and to prevent their return to either country in the future" to a counterinsurgency strategy viewing nation-building and democratization as prerequisites to military success—a highly unrealistic goal in a country that is as poor, illiterate, corrupt, and conflicted as Afghanistan. The mission creep and confusion in Afghanistan has greatly hindered U.S. efforts to find a way to complete its campaign and to disengage. As the target keeps changing and enlarging, public support for the intervention both in the United States and in other nations is declining while the human and economic costs of the war are mounting. A return to the original goal and to some version of the "Biden approach"—advocating reliance on drones, Special Forces, and the CIA to ensure that Afghanistan will not again become a haven for terrorists after the U.S. departure—may provide an answer. Having made the Afghan war the edifice of his struggle against violent extremism, President Obama has been struggling to shape a coherent strategy. His first strategic review of the situation in Afghanistan, completed in March 2009, was basically framed as a counterterrorism mission to be carried out by military forces and the CIA. 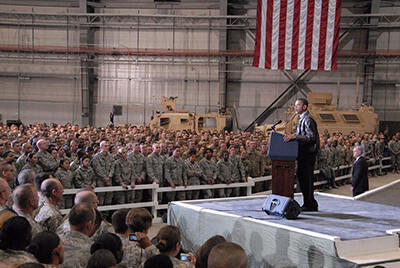 However, over the following year, the president endorsed Gen. David Petraeus's change of strategy from counterterrorism to counterinsurgency, which holds that in order to accomplish the security goal of eliminating terrorists and their havens, a considerable measure of nation-building must take place. In discussions of counterinsurgency, the term "nation-building" is typically avoided, but the precept that to win the United States must build an "effective and legitimate government" and that counterinsurgency means not just destroying the enemy but also holding the territories and building the new polity, in effect amounts to nation-building. Moreover, the scope of nation-building has been steadily extended. Thus, Secretary of State Hillary Clinton has stated that "we share an interest in helping build an Afghanistan that is stable and secure; that can provide prosperity and progress and peace for its citizens." Obama added the following day that he had "reaffirmed the commitment of the United States to an Afghanistan that is stable, strong, and prosperous." He reiterated the 2009 goal to "disrupt, dismantle, and defeat al-Qaeda and its extremist allies in Afghanistan and Pakistan, and to prevent its capacity to threaten America and our allies in the future." But he also underscored the need for "a civilian effort to promote good governance and development … In addition… [to] open the door to Taliban who cut their ties to al-Qaeda, abandon violence, and accept the Afghan constitution, including respect for human rights." As the Hamid Karzai government started to negotiate with various factions of the Taliban about the conditions under which they might support the government, or join it, or lay down their weapons after the departure of U.S. and NATO forces, the nation-building goal was extended. It grew from an "effective and legitimate government" in the eyes of the Afghans to ensuring that democracy and human rights, especially women's rights, as stated in the Afghan constitution (fashioned under U.S. influence and in line with the values Americans hold dear) are respected and that Shari'a or Islamic law does not become the law of the land. Late in 2010, as it became clearer that nation-building was progressing rather poorly, mission creep turned into mission confusion. At several points, the U.S. government opposed negotiations with the Taliban. At others, it endorsed and facilitated these talks. A more moderate goal was mentioned much more frequently: Weaken the Taliban to the point that they become truly interested in a peaceful settlement or in avoiding a civil war among the various ethnic groups after U.S. troops leave. Most recently, a geopolitical goal has been added—namely to ensure that after the U.S. withdrawal, the Afghan government will not tilt toward Pakistan or come under its influence—especially not that of the Inter-Services Intelligence (ISI)—because such a tilt could trouble India, which in turn might lead to a regional war or to India distancing itself from the United States, just as Washington is counting on New Delhi to countervail China. The discussion proceeds by spelling out the reason why nation-building, a key element of counterinsurgency, is not working in Afghanistan, the need to draw much more on structures and leaders already in place rather than building new ones if Washington is to disengage successfully, and it closes by outlining what might be done and what lessons might be learned from this war, one of the longest in which the United States has ever engaged. Champions of nation-building, which often entails pouring large amounts of money on the nations to be reconstructed, ignore the bitter lessons of foreign aid in general. An extensive 2006 report on the billions of dollars invested by the World Bank since the mid-1990s in economic development shows that despite the bank's best efforts, the "achievement of sustained increases in per capita income, essential for poverty reduction, continues to elude a considerable number of countries." Out of twenty-five aid-recipient coun­tries covered by the report, more than half (14) had the same or worsening rates of per capita income from the mid-1990s to the early 2000s. Moreover, the nations that received most of the aid, especially in Africa, developed least while the nations that received very little aid grew very fast (notably China, Singapore, South Korea, and Taiwan). Other nations found foreign aid a "poisoned gift" because it promoted dependency on foreigners, undermined indigenous endeavors, and disproportionately ben­efited those gifted at proposal writing and courting foundation and foreign aid representatives, rather than local entrepreneurs and businessmen. In addition, the World Bank and other students of development have learned that large parts of the funds provided are wasted because of widespread and high-level cor­ruption. In The White Man's Burden, American economist William East­erly systematically debunked the idea that increased aid expenditures in and of themselves can alleviate poverty or modernize failed or failing states and pointed to the key roles that bad government and corruption play in these debacles. Steve Knack of the World Bank showed that huge aid revenues may even spur further bureaucratization and worsen corruption. Others found that mismanagement, sheer incompetence, and weak government were almost as debilitating. Afghanistan was ranked by Transparency International as the third most corrupt nation in the world in 2010. Its government lost much of whatever legitimacy it had following fraudulent elections. It does not govern large parts of the country. It surely qualifies as a failing state—eight years after reconstruction began with few signs of improvement. A 2008 study by The Economist found that several of the main reasons that Afghanistan's development is proceeding so poorly are the widespread corruption, cronyism and tribalism, lack of accountability, and gross mismanagement. The Economist recommended that the West pressure President Karzai to introduce reforms. But how should Karzai proceed? Should he call in all the ministers and ask them to cease taking bribes and stop allocating public funds to their favorites? Fire them and replace them—with whom? And if he did, what about their staffs? Many of the police, judges, jailors, customs officers, and civil servants in Afghanistan regularly accept bribes and grant strong preference to members of their family, clan, and tribal group. Most are poorly trained and have no professional traditions to fall back on. How is a president, even one backed by foreign powers, to change these deeply ingrained habits and culture? One may argue that such reforms occurred in other countries, including in the West. Indeed, social scientists could do a great service to developing nations if they conducted a thorough study of how those nations succeeded in curbing corruption and gross mismanagement. The study would probably show that the process took decades, if not genera­tions, and that it entailed a major change in social forces (such as the rise of a sizable middle class) and major alterations in the education system—among other major societal changes. Such changes cannot be rushed and must be largely endemic. Many conditions that are unlikely to be reproduced elsewhere led to successful reconstruction in Germany and Japan after World War II. First, both nations had surrendered after defeat in a war and fully submitted to occupation. Second, many facilitating factors were much more established than they are in countries in which social engineering is now being attempted. There was no danger that Japan or Germany would break up due to a civil war among ethnic groups as is the case in Afghanistan and Iraq. No effort had to be expended on building national unity. On the contrary, strong national unity was a major reason change could be introduced with relative ease. Other favorable factors included competent government personnel and a low level of corruption. Political scientist Robert Packenham cites as core factors the pres­ence of "technical and financial expertise, relatively highly institutionalized political parties, skillful and visionary politicians, well-educated populations, [and] strong national identifications." And, crucially, there was a strong culture of self-restraint present in both Japan and Germany that favored hard work and high levels of saving, essential for building up local assets and keeping costs down. Conditions in the donor countries were different as well. In 1948, the first year of the Marshall Plan, aid to the sixteen European countries involved 13 percent of the U.S. budget. In comparison, the United States currently spends less than 1 percent of its budget on foreign aid, and not all of it is dedi­cated to economic development. Other nations are giving relatively more, but the total funds dedicated to foreign aid are still much smaller than those committed to reconstruction at the end of World War II. In short, the current tasks are much more onerous, and the resources available are meager in comparison. Sociologist Max Weber established the importance of culture or values when he demonstrated that Protestants were more imbued than Catholics with the values that lead to hard work and high levels of saving, essential for the rise of modern capitalist economies. For decades, developments in Catholic countries (such as those in southern Europe and Latin America) lagged behind the Protestant Anglo-Saxon nations and those in northeast Europe. These differences declined only when Catholics became more like Protestants. Culture is also a major factor that explains the striking differences between various rates of develop­ment, especially between the Southeast Asian "tigers" (which received little aid) and African and Arab states that received a great deal. It is not that these latter states cannot be developed because of some genetically innate characteristics of the people living there, but because their cultures stress other values, especially traditional religious values and commu­nal and tribal bonds. These cultures can change, but, as the record shows, only slowly, and the changes involved cannot be foisted upon them by outsiders. When all is said and done, one must expect that development of countries such as Afghanistan will be very slow and highly taxing on all involved, which is exactly what has happened there. Corruption continues to be endemic at all levels of the Afghan government. Efforts to suppress the growth of opiates and the illegal drug trade have failed. Warlords continue to play a major role in large parts of the country. The government is not considered legitimate, following fraudulent elections. The majority of citizens feel that the judiciary is bought, law and order is lacking, and a considerable number are yearning for the days when the Taliban were in charge. Indeed, the Taliban influence is growing in parts of the country, including in the north, where it was weak in earlier years. All this indicates that counterinsurgency efforts are very unlikely to succeed in the foreseeable future. This is quite openly acknowledged by General Petraeus, who called for patience in a 2007 BBC interview because "the average counterinsurgency is somewhere around a nine or a 10 year endeavor," and the British counterinsurgency in Northern Ireland took "decades." But Americans and the citizens of other involved nations are very unlikely to support such a long-run project at such high cost, which is estimated to already have cost the U.S. government $336 billion by the end of 2010, and with the addition of $119 billion requested for 2011, will cost $455 billion by the end of 2011. In short, the nation-building goals are too ambitious and must be abandoned. The nation-building project has been a top-down one. Washington and its allies sought to rely on the national government headed by President Karzai and on a constitution that centralizes more power in the national government than any democratic society and in a society in which local, ethnic bonds and commitments are far stronger than in any democratic society. The national government appoints provincial and district governors and city mayors. Although district councils are supposed to be elected, elections have not yet taken place. At the same time, the Afghan sense of nationhood is weak, and the primary loyalty of most Afghans is to their ethnic group—the Pashtuns, Tajiks, Hazaras, Uzbeks, Turkmen, etc. Moreover, the national army has a disproportionately high number of officers from non-Pashtun groups, especially the Tajiks, while the Taliban's closest affinity is with the Pashtun and further divides society along ethnic lines. Attempts to reduce the tension between the political structure and the societal one have run into difficulties because of the close alliance between the coalition forces and the national government. To disengage, much more attention will have to be paid to local powers and local institutions and leaders that are in place. Alexander Thier, the director for Afghanistan and Pakistan at the U.S. Institute of Peace, and Jarat Chopra, a former professor at Brown University, write that in Afghanistan, "family and tribal affiliations outweigh all others" and that tribal elders "are not willing to place a united Afghanistan over advancement of their particular tribe." The Taliban were defeated in Afghanistan in 2001 with very few U.S. casualties; only twelve U.S. service members were killed. This has obscured the fact that the war was won by a U.S.-supported coalition of ethnic groups, mainly Tajik, Uzbek, and Hazara, known as the Northern Alliance. U.S. officials tend to favor national forces although even in the United States, much police work is locally and not nationally controlled. Even the U.S. National Guard can be called up only by the governors of the various states, and each unit primarily serves its own state. Yet in Iraq, after U.S.-led coalition forces removed the Saddam regime, Washington and its allies tried to create a national force by insisting that Sunni, Shiite, and Kurdish units either disarm or be integrated into a national force. Moreover, initially the Bush administration positioned Shiite forces in Sunni areas and Sunni forces in Shiite areas in the hope that they would cease to view themselves as tribal forces and start acting like "Iraqis." The result was often increased bloodshed. A similar development took place in Afghanistan. In the aftermath of the defeat of the Taliban in 2001, the new Afghan government sought to disarm the tribal forces that had ousted the Taliban—what the government referred to as the AMF (Afghan Militia Forces)—in favor of fashioning a new national army. As a result of this disarmament, demobilization and reintegration, about 63,000 militiamen were disarmed by 2005. However, there are still a great number of unofficial ethnic forces and other private armies. Estimates of their size run between 65,000 and 180,000. Recently several attempts have been made to work with local forces. NATO forces have contracted with private security companies to secure dangerous stretches of highway, while the Local Police Force Program was established in July 2010 as part of a larger "village stability platform" to supplement the Afghan National Army and provide regional security. In Wardak province, the Afghan Public Protection Program has helped to establish security in what was a Taliban stronghold. To further disengage, Washington and its allies will have to shift more weight and resources to these local forces and rely less on the Karzai government. An essential feature of a stable political system, and one able to adjust as changes occur, is the availability of institutions that can be used to settle differences without resorting to violence. Westerners tend to assume that these political institutions will be democratic and that various particularistic interests will be represented by elected officials. In this way, ballots will replace bullets. In Iraq and Afghanistan, the U.S. government and its allies invested considerable effort in introducing free and fair elections, in part to serve the purpose of absorbing ethnic and regional conflicts into political institutions. Given, however, that the format of the introduced political institutions was greatly influenced by U.S. guidelines, they often do not reflect the preferences of the majority of the Afghan people. For instance, Washington insisted that the Afghan constitution be drafted and approved by consensus before the election of the National Assembly and national officials, and it promoted Karzai as the national leader. None of these moves helped lend legitimacy to political institutions that were imported and alien to begin with. In Afghanistan, as in other countries in similar states of societal development, native people have their own institutions and their own ways of selecting leaders and resolving conflicts. These include tribal councils, community elders, and religious authorities. That is, the people often rely on natural leaders—those who rose to power due to their charisma, persuasive powers, lineage or religious status, but who were not elected in the Western way. Initially, it is best to try to work with them, rather than expect that they could be replaced by elected officials in short order. The same holds for various councils and inter-tribal bodies. Seth Jones of the RAND Corporation argues that a strategy that seeks to build a strong central government and to hold territory with foreign forces is unlikely to work in Afghanistan. He reports that the national presidential elections in 2004 and parliamentary elections in 2005 did little to diminish the power of regional warlords and tribal militias. Even efforts that were made to relocate such leaders and wrest them from their regional power bases were unsuccessful. Instead of attempting—and failing—to break these solid ties, strategists should draw upon them to promote security in Afghanistan. Jones points out that a successful bottom-up strategy must strengthen the local tribal and religious leaders who understand their communities best, so that they may provide security and services. Indeed, he writes that "the most effective bottom-up strategy in Afghanistan is likely to be one that already taps into existing local institutions … Local tribal and religious leaders best understand their community needs." To illustrate the influence of local natural leaders, one only needs to look at Ismail Khan. After the defeat of the Taliban, Khan, a warlord in Herat, became governor of the area. Despite his ability to maintain security, Khan's support of Iran and his refusal to send the tax revenues he collected to the central government in Kabul, coupled with a wish to strengthen Karzai, led Washington to urge his removal. Khan was removed from his local post in 2004, a move that resulted in violent protests,  sectarian violence, increased crime, and the Taliban making inroads into Herat. Similarly, Governor Gul Agha Shirzai of the Nangarhar province was removed from a previous gubernatorial position because of his autocratic, warlord style but is now viewed as necessary to stabilize the province. Atta Muhammad Noor, the governor of Balkh province, has been credited with bringing security to his province and eradicating the poppy trade there. This is not to suggest that all these tribal chiefs can or should be made into local partners. Each must be examined in his own right. However, one can work with many to improve their records. The more Washington and its allies work with local leaders, including religious ones, the sooner it will be able to disengage. There remains a danger that if the U.S. forces disengage, having increasingly drawn on local forces to provide security and stability in their area of the country, a civil war might break out among various groups, especially among the Pashtun and other ethnic groups, or among various warlords. The best way to minimize this risk is not to presume that one can fashion an effective national government to which various local power centers will yield but to work out inter-local coalitions, treaties, and agreements. Recently, an argument surfaced that the United States cannot withdraw from Afghanistan until that country is well-stabilized because such a withdrawal would cause Pakistan—especially the ISI—to greatly extend its support for violent Islamist groups in Afghanistan and use it as a base for terrorist attacks against India. This could result in a new battleground for Indo-Pakistani rivalry, bring other powers into a confrontation, and even risk a nuclear war. What Pakistan wants most in Afghanistan is an assurance that India cannot use it to threaten Pakistan. For that, a radical Islamic movement like the Taliban, with strong ties to kin in Pakistan, fits the bill. Cooper also believes that Pakistan wants to keep the Taliban in its "good graces" should U.S. forces withdraw and leave the Taliban to reassert control over the country. Likewise, Shuja Nawaz of the Atlantic Council asserts that Pakistan's support of extremists is "leverage in the sense that it allows [the Pakistanis] to have a government in Kabul that is neutral, if not pro-Pakistan. That's why they've always hedged on the Afghan Taliban." There is an ethnic dimension to the Indo-Pakistani rivalry in Afghanistan, as well. Pakistan wants an Afghan government that provides greater representation for the Pashtun and is more closely allied with Pakistan. The current Afghan government contains more Tajik, Uzbek, and Hazara members that were aligned with the India-backed Northern Alliance, and thus Pakistan perceives the current Afghan government as being too close to India. Additional evidence to support the claim that Pakistan is at least somewhat favorable to the Taliban and would be more so should U.S. forces withdraw, can be seen in the accusations that Islamabad is undermining the current peace talks between the Afghan government and the Taliban. According to The New York Times, Pakistan's apparent stance against the peace process is due to the fact that the Karzai government is reported to be leaving out those Taliban members regarded as being controlled by the ISI. Those Taliban leaders not associated with Pakistan who do show willingness to negotiate have been suppressed by Pakistan; for example, Pakistani agents arrested high-level Taliban official Mullah Baradur. The New York Times also reports, "Afghans who have tried to take part in, or even facilitate, past negotiations have been killed by their Taliban comrades, sometimes with the assistance of Pakistan's intelligence agency." A number of observers have suggested that a U.S. withdrawal from Afghanistan would precipitate the return of the Taliban with ties to Pakistan that would enable increased terrorism against India. As Steve Coll observed in a New Yorker blog, "The probable knock-on effect of a second Taliban revolution in Afghanistan would be to increase the likelihood of irregular Islamist attacks from Pakistan against Indian targets—not only the traditional target set in Indian-held Kashmir, but in New Delhi, Mumbai, and other cities, as has occurred periodically during the last decade." Likewise, Robert Kaplan writes in a report for the Center of New American Security that Afghanistan is a "principal invasion route into India for terrorists" and "an Afghanistan that falls under Taliban sway … would be, in effect, a greater Pakistan, giving Pakistan's Inter-Services Intelligence Directorate [ISI] the ability to create a clandestine empire composed of the likes of Jallaluddin Haqqani, Gulbuddin Hekmatyar and Lashkar-e-Taiba." The latter group carried out the 2009 Mumbai terror attacks against India. The quickest way to undermine U.S.-India relations is for the United States to withdraw precipitously from Afghanistan … [It] would signal to Indian policy elites that the United States is surely a declining power on which they cannot depend. Détente with China might then seem to be in India's interest. During off-the-record briefings in Washington, conducted under Chatham House rules, which allow the use of the information but not the identification of the source or organization at which the briefing took place, U.S. State Department officials indicated that indeed the department saw the need to keep India on the U.S. side for many reasons but especially to "balance" China, a major consideration in determining the role Washington should play in Afghanistan. The frequent re-juggling of the goals of a mission and lack of clarity on what they are is detrimental to any campaign. The main difficulties the U.S. administration faces in Afghanistan are due to mission creep generated by nation-building—in both the somewhat-limited counterinsurgency version and the expanded human rights and democracy version—often a highly unrealistic goal, in particular in a country that is as poor, illiterate, corrupt, and conflicted as Afghanistan. The military mission, as originally defined by President Obama, was achieved in Afghanistan but not in Pakistan. However, there is no reason to hold that continued fighting in Afghanistan, by drawing on large conventional forces and a similar number of private contractors, will change the situation in Pakistan. Attempts to move the government to confront the Pakistani Taliban and eradicate the havens for Afghan terrorists in that country have largely failed. So have most efforts to pressure, cajole, or incentivize Islamabad to change the balance between the largely anti-U.S. ISI and the other parts of the military—and between the military and the civilian authorities in favor of the latter. Pakistan continues to have a rather unstable regime, to harbor terrorists, to be unable to put down an insurgency, to hold nuclear arms, and to be headed by a civilian government that is unpopular. The most promising avenue for significant change in Pakistan lies in helping it and India to settle their major differences, which would free the Pakistani military from its eastward obsession and enable it to fight terrorism and insurgency, improve the economy, and downgrade the importance of nuclear arms. This is a very challenging mission, which might well be impossible to carry out. However, the prospects of such a settlement have little to do with what is happening on the ground in Afghanistan. With regard to the geopolitical goal, New Delhi has many interests that Washington can serve—or neglect—from continued outsourcing to deals concerning fuel for nuclear reactors and technical knowhow, from weapon agreements to sharing intelligence about terrorists. For example, U.S. intelligence agencies are reported to have had knowledge about those who attacked Mumbai before they struck. Hence, given the high costs of staying the course in Afghanistan and the likelihood that it will fail, Washington will be better served if it disengages even if this leads to some displeasure in India. Moreover, it further suggests the important role Washington can have by fostering a settlement of the Kashmir issue and other sources of conflict between India and Pakistan—a win-win situation compared to overstaying in Afghanistan to please India—a lose-lose condition. It remains for another day to ask whether the whole notion of nations such as India "balancing" nations such as China is not a highly anachronistic one, harkening back to the days when nations had no ideological commitments and shifted sides to maintain a balance of power. In recent years, a consensus is emerging among students of international relations that U.S. power is declining and that its foreign policy will have to adapt to its increasing weakness. This thesis has numerous facets and implications, only one of which is here explored—namely, the argument that because of the stressed condition of the U.S. economy, interventions of the kind seen in Iraq and Afghanistan will no longer be possible, at least in political ways. the limits that constrain the government in its external initiatives will be drawn less on the basis of what the world requires and more by considering what the United States can—and cannot—afford. In an era in which fewer resources will be available for everything, it is certain that fewer will be available for foreign policy. When working Americans are paying more than in the past to support their fellow citizens who have retired, and retirees are receiving fewer benefits from the government than they were promised, neither group will be eager to offer generous support to overseas ventures. I think the Congress and the president would look long and hard at another military operation that would cost us $100 billion a year … If there's a real threat out there, the president and Congress will spend whatever it takes to protect the nation. But in situations where there are real choices, I think this would be a factor. If we become weak and enfeebled by economic decline and debt, as we slowly are, America may not be able to play its historic stabilizing role in the world. This viewpoint is based on the failed and costly attempt to engage in nation-building but does not apply to military interventions. Thus, the U.S. intervention in 1991 that rolled Saddam out of Kuwait exacted a heavy cost from Iraq for violating another nation's sovereignty and shored up U.S. credibility in the world, but it was achieved swiftly with few casualties and at a low cost of $61 billion, almost 90 percent of which was borne by U.S. allies. The same is true of 1989's Operation Just Cause in Panama. The 2003 invasion of Iraq and the removal of Saddam's regime were carried out swiftly with few casualties and low costs. Only $56 billion had been appropriated for Iraq operations by the time President Bush declared "Mission Accomplished" on May 1, 2003, and 172 U.S. servicemen had died. Most of the casualties and costs were inflicted during the nation-building phase that followed. Since May 2003, more than 4,500 Americans have died and hundreds of thousands of Iraqis, and the direct financial cost has totaled $650 billion. The overthrow of the Taliban in 2001 was carried out swiftly with minimal U.S. casualties and low costs. Most of the casualties and costs that followed took place during the nation-building phase—only $21 billion was spent in 2001 and 2002 while the costs since then have amounted to more than $300 billion. Only twelve U.S. soldiers died in Afghanistan in 2001, but almost 1,300 more have died since then. Thus, it is wrong to conclude that the United States will be unable to afford military interventions to support its foreign policy goals, for instance, compelling Iran to give up its nuclear sites—although they are likely to be substantially higher than the interventions just cited—as long as no nation-building follows. This is not to suggest that the United States should go to war because wars are cheap. On the contrary, a nation should engage in a "just war" if and only if there is a clear and present danger, if all other means to resolving the conflict have been exhausted, and only to protect innocents. However, when the United States must engage in war, economic considerations will not prevent it from proceeding. Some argue that Washington has a moral obligation to "reconstruct" countries it invades. Opinions can differ on what the United States owes a country it helped liberate or that used to harbor terrorists. However, in any case, given that nation-building cannot be carried out long-distance by foreign powers in nations in an early state of development (in contrast to post-World War II Germany and Japan), the moral issue is moot. At the same time, there is no reason to stop non-lethal interventions through educational, cultural, and public diplomacy means, from Fulbright scholarships to foreign aid. It is also worth noting that diplomacy is dirt cheap. The U.S. State Department budget famously has fewer foreign service officers than the Pentagon has military band musicians. Granted, a return to military interventions and counterterrorism without counterinsurgency efforts would mean that once the United States topples a regime that endangers it or others, the people of the nation will have to duke it out to determine which kind of regime will be established without coerced U.S. tutelage. Hence, for instance, if the people of Afghanistan find that the Shari'a law that the Taliban is promoting is too harsh from their viewpoint, they will have to fight the Taliban. On the other hand, if they favor a strict Shari'a regime, the swift justice the Taliban metes out, its harsh way of dealing with pedophilia and drug dealers—combined with injustice to women—then Washington should let them embrace that regime while exhorting them to work for reforms, the way it does in many nations in the Middle East and elsewhere. In any event, the American decline is to a considerable extent a reflection of an inability to live up to the excessively ambitious goals Americans set for themselves. It matters little whether this goal-setting is due to an idealistic American commitment to human rights and democracy, to falling prey to public relations, to a lack of realism, or to sheer arrogance and hubris. If the United States limits its goals to key national interests and global security—it can readily afford to use its power for good purposes. Amitai Etzioni is a university professor and professor of international relations at George Washington University, director of the Institute for Communitarian Policy Studies, and the author of Security First: For a Muscular, Moral Foreign Policy (Yale University Press, 2008). Barack Obama, "Remarks by the President on a New Strategy for Afghanistan and Pakistan," Mar. 27, 2009. Hillary Clinton, "Remarks at Reception in Honor of Afghan President Hamid Karzai," May 11, 2010. Barack Obama, "Remarks by President Obama and President Karzai of Afghanistan in Joint Press Availability," May 12, 2010. The Guardian (London), July 19, 2010. "Annual Review of Development Effectiveness 2006: Getting Results," World Bank Independent Evaluation Group, Washington, D.C., 2006. Stephen Knack, "Aid Dependence and the Quality of Governance: Cross-Country Empirical Tests," Southern Economic Journal, 2 (2001): 310-29. "2010 Corruption Perceptions Index," Transparency International, Berlin, accessed Jan. 12, 2011. "A War of Money as Well as Bullets," The Economist, May 24, 2008. See, for example, Susan Rose-Ackerman, Corruption and Government (Cambridge: Cambridge University Press, 1999). Robert A. Packenham, Liberal America and the Third World (Princeton: Princeton University Press, 1973), pp. 34-5. Curt Tarnoff and Larry Nowels, "Foreign Aid: An Introductory Overview of U.S. Programs and Policy," Congressional Research Service, Washington, D.C., Apr. 15, 2004. Max Weber, The Protestant Ethic and the Spirit of Capitalism, 2 ed. (Abingdon, N.Y.: Routledge Classics, 2001). The Washington Post, Dec. 6, 2010. BBC News, July 9, 2007. Amy Belasco, "The Cost of Iraq, Afghanistan, and Other Global War on Terror Operations since 9/11," Congressional Research Service, Washington, D.C., Sept. 2, 2010. Antonio Giustozzi, "Afghanistan's National Army: The Ambiguous Prospects of Afghanization," Terrorism Monitor, Jamestown Foundation, Washington, D.C., May 1, 2008. Alexander Thier and Jarat Chopra, "Considerations for Political and Institutional Reconstruction in Afghanistan," U.N. Public Administration Network, New York, Jan. 2002. The New York Times, June 5, 2010; Seth G. Jones and Arturo Munoz, Afghanistan's Local War: Building Local Defense Forces (Santa Monica: National Defense Research Institute, RAND Corporation, 2010), p. 57. See, also, Andrew M. Roe, "What Waziristan Means for Afghanistan," Middle East Quarterly, Winter 2011, pp. 37-46. Seth G. Jones, "U.S. Strategy in Afghanistan," RAND Corporation, Santa Monica, testimony before the House Foreign Affairs Committee, Subcommittee on Middle East and South Asia, Washington, D.C., Apr. 2, 2009. The Washington Post, Feb. 21, 2006. Environment News Service (Washington, D.C., and Seattle), June 6, 2007. The Economic Times (Mumbai), Nov. 10, 2010. Helene Cooper, "Allies in War, but the Goals Clash," The New York Times, Oct. 9, 2010. The New York Times, Oct. 19, 2010. Steve Coll, "What If We Fail in Afghanistan?" The New Yorker, Nov. 16, 2009. Robert D. Kaplan, "South Asia's Geography of Conflict," Center for a New American Security, Washington, D.C., Aug. 2010. Associated Press, Apr. 25, 2010. Coll, "What If We Fail in Afghanistan?" Kaplan, "South Asia's Geography of Conflict." The Washington Post, Oct. 16, 2010. Michael Mandelbaum, The Frugal Superpower: America's Global Leadership in a Cash-Strapped Era (United States: Public Affairs, 2010), p. 33. The Telegraph (London), May 9, 2010. Thomas L. Friedman, "This I Believe," The New York Times, Dec. 1, 2009. "Conduct of the Persian Gulf War," final report to the U.S. Congress by the U.S. Department of Defense, Washington, D.C., Apr. 1992, appendix P.
 "The Cost of Military Operations in Iraq: An Update," analysis by the House Budget Committee's Democratic staff, Washington, D.C., Sept. 23, 2003. "The Budget and Economic Outlook: An Update," Congressional Budget Office, Washington, D.C., Aug. 2010. Belasco, "The Cost of Iraq, Afghanistan, and Other Global War on Terror Operations Since 9/11." "Faces of the Fallen," The Washington Post, accessed Jan. 12, 2010. Noah Feldman, What We Owe Iraq: War and the Ethics of Nation Building (Princeton: Princeton University Press, 2004), p. 80; Bill Wineke, "Whatever Happened to Freedom Fries," Wisconsin State Journal, June 12, 2005; Gerard F. Powers, "The Dilemma in Iraq," America, Mar. 6, 2006, pp. 19-26. National Public Radio, Sept. 29, 2010. For more discussion, see Amitai Etzioni, Security First (New Haven: Yale, 2007); idem, "The Promise of the Proliferation Security Initiative," Foreign Affairs, May/June 2009. Related Topics: Central Asia, US policy | Amitai Etzioni | Spring 2011 MEQ receive the latest by email: subscribe to the free mef mailing list This text may be reposted or forwarded so long as it is presented as an integral whole with complete and accurate information provided about its author, date, place of publication, and original URL.